Nestled in the forested hills of southern Guatemala, the small city of Antigua was once the most prominent seat of Spanish colonial government between Mexico City and Lima, Peru. Founded in the early 16th century, it served as Guatemala’s capital for almost 300 years, until 1773, when it was abandoned by crown officials following a series of devastating volcanic eruptions, earthquakes and floods. In the mid-1800s, agriculturists took note of Antigua’s rich volcanic soils, and the city thrived once again, as a center of coffee and grain production. 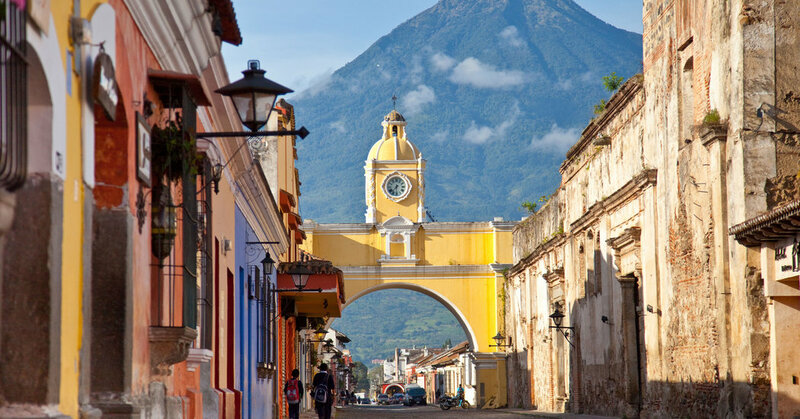 It was during this period that its canary-colored Santa Catalina Arch, built in 1694 as a walkway for nuns, received its domed clock tower, becoming Antigua’s most iconic monument. In 1979, Unesco designated Antigua a World Heritage Site, ensuring the protection of its architectural and cultural legacy. The 20 guest rooms at this tranquil boutique hotel surround a colonnaded courtyard shaded by fruiting guava and mandarin trees. The interiors are pleasingly minimalist — colorful wool throws handmade by a local weaving cooperative complement whitewashed walls and palo-blanco wood furnishings — and many rooms feature private patios, open-air showers and expansive mezzanines. What’s more, after expenses and staff are paid, the property donates all remaining profits to Niños de Guatemala, a nongovernmental organization that offers educational assistance to local youth. The fare at this farm-to-table restaurant and organic garden, set on the outskirts of Antigua on a former coffee and rose farm, includes homemade sourdough sandwiches and wood-fired pizzas. Locals gather here all week long but especially on weekends, when there is live music and a farmers’ market, and when Rincon Típico, a second restaurant, offers Guatemalan cuisine prepared with an artisanal twist, such as steamed masa tamales served with farm-grown Swiss chard, avocado and black beans. The farm’s store also sells locally made produce, ranging from raspberry jam to fresh kombucha and hibiscus juice. At this all-day cafe in downtown Antigua, the chef Laura Ayyoub produces colorful Middle Eastern comfort food made from Guatemalan ingredients. Pull up a stool at the main bar — topped with a kaleidoscopic tile mosaic — and order an iced almond-milk matcha latte with a bacon, egg and jalapeño breakfast bagel, or crispy sourdough bread topped with magenta beetroot hummus, feta and a za’atar-spiced fried egg. Helmed by the chef Mattia Bellucci, this organic restaurant in downtown Antigua is known for its hyper-local renditions of Italian classics, such as cibreo de higado, chicken liver made both savory and sweet with a flambéed and caramelized crust. The spaghetti, ravioli and tortellini are all made in-house — as are the cheeses and breads, from creamy stracciatella di bufala to baked-fresh brioche. Guests dine either indoors, in a colonial-era house decorated with local art, or in a flower-filled outdoor courtyard. Above the dining area, the restaurant rents out an airy loft with three luxurious hammock-strewn bedrooms designed by Bellucci’s wife, the Honduran artist Alexa Maithé Henry. For nearly five years, this contemporary art foundation has led Antigua’s growth as a creative destination through open studios and exhibitions. Located within Antigua’s historic downtown and connected to the 16th-century Santa Ana church, the foundation will launch La Nueva Fábrica, a new art center, in February. Set in an adjacent building once home to a textile factory, it will showcase contemporary art and documentary photography while also offering exhibition space to artists in the foundation’s residency program. This former convent, erected in 1736 for an order of Antiguan nuns, is a masterpiece of the famed architect Diego de Porres, who created many of the city’s most celebrated colonial sites, including the Fountain of Mermaids in the city’s central plaza, inspired by the Fountain of Neptune in Bologna, Italy. Near the structure’s courtyard — framed by an arched colonnade and a wall of bougainvillea — is a museum that houses one of the city’s most important permanent exhibitions of colonial-era art and pre-Hispanic pottery. 2a Avenida Norte at 2a Calle Oriente.